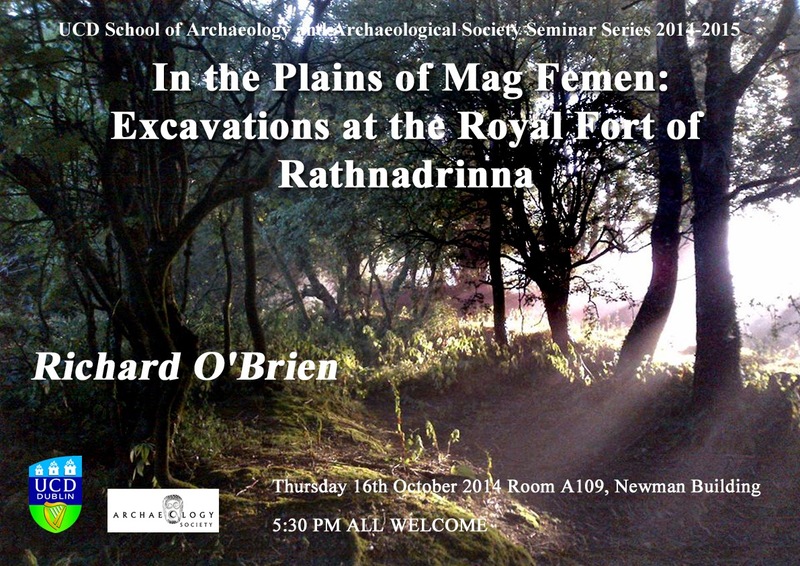 This week, Richard O’ Brien, lead excavator at the Quadrivallete ringfort at Rathnadrinna gave a lecture titled: In The Plains of Mag Femen: Excavations at The Royal Fort of Rathnadrinna. The Rathnadrinna royal site located just outside Cashel, County Tipperary has been the location of an immensely interesting and successful archaeological project over the last five to six years. Being a Multivallete ringfort the site is considered a royal site of vital importance. However, before 2009 very little work was done on this monument. It is also important to remember to keep the Rock of Cashel in mind as it was probably closely related with this fort being a royal site itself. As a summery, the fort ditch measures 40 meters externally and geophysics have confirmed a significant number of auxiliary forts located around the main site. While not situated as high as The Rock of Cashel it is still placed on a noticeable prominence giving an impressive view of the surrounding countryside. As of today it is still not considered a national monument but that may change once Richard publishes his report. Following the introduction and site summery, Richard continued with a chronological description of the work undertaken at Rathnadrinna from 2009 to present. Between 2009 and 2010 geophysics were carried out on the fort and the surrounding area. These surveys yielded a significant amount of results including the aforementioned satellite forts as well as ringbarrows and a large number of pits and ditches within the fort itself. Following these the discoveries Richard received funding from the Royal Irish Academic Society for three seasons of excavation (20 weeks in total). Excavations began on the site on June 11th 2012 however Richard told us that they were met with immediate difficulty on the first day. Due to one of the wettest summers on record the trenches were soon flooded and progress slowed significantly. Work continued regardless of this problem and once the trenches dried out enough, work resumed. Interestingly that year, pre-fort features were discovered within the fort ramparts including stakeholes and a house with a possible hearth. Excavations continued as planned in summer, 2013 which had more focus within the fort interior and the many ditches discovered during the surveys. Cutting 2 C focused on an interesting arcing ditch and pit circle feature which was unusual thing to find within the fort itself. These features were dated to the Iron Age but respected an earlier Bronze Age ditch. Richard then continued on to discuss the excavations carried out this year. Around twenty Early Medieval houses were uncovered with multiple overlapping wall slots and a huge amount of stakeholes and postholes within cutting 2 C. These buildings indicate the importance of this site and its continuing use over time. Meanwhile in cutting 3, a metal working area also dating to the Early Medieval period was found with cobbling and charcoal deposits. Richard concluded with a brief report on the material finds at the site. These included Worked wood, a copper alloy stud mount from a reliquary with gold coating, various pieces Iron and lead slag and a small number of lithics. Richard is hoping to continue work on this site for the foreseeable future and it is worth checking out. The Rathnadrinna Facebook page posts regular updates on the status of the site as well as the ongoing research associated with it.